The 2016 News Sentinel Open golf tournament on the Web.com development tour for the PGA Tour is taking place this week from August 18-21, 2016, at the Fox Den Country Club located in Knoxville, Tennessee. Here is a list of the prize money up for grabs for the Web.com players at the 2016 News Sentinel Open. 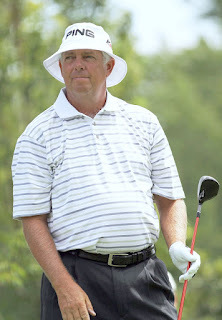 The News Sentinel Open golf tournament on the Web.com Tour dates back to 1990. Notable winners of the tournament include PGA Tour winners Jeff Maggert, J.J. Henry, Heath Slocum, Vaughn Taylor, Chris Kirk, Kirk Triplett (pictured above) and Peter Malnati. Total prize money up for grabs at the 2016 News Sentinel Open is $550,000. That is the same amount of prize money that was up for grabs last year. Any player who wins three times on the Web.com Tour automatically earns their PGA Tour card. The winner of the 2016 News Sentinel Open will earn $99,000. That is the same amount of prize money that Patton Kizzire earned when he won this tournament last year. Second place is worth $59,400 at the 2016 News Sentinel Open. Third place at the 2016 News Sentinel Open golf tournament on the Web.com Tour is worth $37,400.